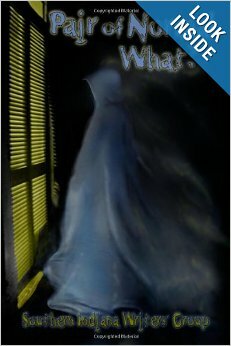 Here’s a bit from the Southern Indiana Writers’ Group’s newest anthology, a collection of paranormal stories, entitled A PAIR OF NORMAL WHAT? One of my stories is “Fangs For Nothing,” a supposedly humorous vampire story. I’ve posted bits from it before, but I’m too lazy busy to look back and see if I’ve done this bit. If I have, consider this a rerun. With apologies to Damon Runyon. Now, direct sunlight is no better for vampires than it is for anybody else, but most of us can tolerate a reasonable amount. I doubt a sudden burst of daylight will do more than give this Mansfield Parker a sneezing fit, but this, I do not say. I also do not say that, if he is so terrified of regular people, he needs to get a bodyguard, and the reason I do not say this is that I am afraid Vlad the Roumanian will think I am volunteering for the job which, to be perfectly honest, I am not. I try to imagine the citizens of Ithaca, New York, as such a mob, and fail. I open my mouth to protest that I am a simple businesswoman, not an investigator, but my brain gets a stranglehold on my tongue and shows it what Vlad the Roumanian will do to my neck if I contradict him, and I simply make a compliant noise into the telephone. Sure enough, though, the front door opens, and who should come out but Jasper Caufmann. Jasper Caufmann is the regular guy I work with the last time Vlad the Roumanian pays me the doubtful compliment of asking me to investigate something for him. Why, I wonder, does Vlad the Roumanian not tell me that Mansfield Parker’s Maygar is my old acquaintance? Does he think I will take my life in my hands and turn down the assignment, if I know this? Or does he simply not consider it important, one regular guy being pretty much the same as another in Vlad the Roumanian’s eyes? At any rate, this is none other than Jasper Caufman, so plump and pale he could play the part of a guy drowned two days ago and not need much makeup whatsoever. Caufmann jerks so hard, his keys fly up into the air and land, with a merry jingle, on his nearly bald head. His eyes cross, and I think he may collapse in a piddle of nerves, but this he does not do. A WRITING PROMPT FOR YOU: How would your main character take it if somebody slipped up behind them and said, “Boo”? This entry was posted in Sample Sunday. Tagged paranormal, short story excerpt, vampires. Since my main character is me, you can guess. Even with the world’s most powerful smelling salts, don’t expect me back afoot until next Thursday. Perry Block would love to share..A Little Help Please?